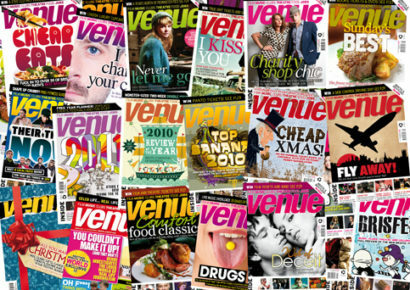 VENUE magazine is saved, is the word on the street. The magazine has printed sincere thanks to the hundreds of readers who wrote, protested, called, posted objections and most of all took out subscriptions. It was a fantastic response by a huge local readership who really care about the mag and appreciate what it does for the community. It was also a brilliant vote of confidence. The outcome is that Venue will remain – as a monthly publication, tacked onto the back of Folio magazine, and free. And yes, listings are up online. Well, all things must change, as the poet said. And sighs of relief all round that jobs are saved, the imprint is still there, and Bristol’s best-loved journalistic incubator of local talent, culture, music and arts isn’t going to vanish without trace. None the less, it won’t be weekly. It won’t be paid-for. It’s bound to be different. We’re still thinking of you, Venue. It’s a stay of execution, for sure; but here in Bristol NUJ we’re hoping for more than that. We’re hoping for lots of jobs for lots of good people, and we want Venue to flourish like the independent, sassy, smart, successful publication it is.